Last month we reported that Kitty Kat West was found dead, possibly murdered. Turns out it was the husband who appears to have done it and he killed her with a bottle of absinthe. Kathleen West, 42, was discovered half-naked and bleeding from the head by a shocked neighbor outside her house in Calera, Alabama, last month. Under the pseudonym “Kitty Kat” she charged website punters £11 a month for access to raunchy images of “mature hotties”. Her husband William “Jeff” West was arrested on murder charges on Thursday, according to US media. An arrest warrant states that Mrs. West died from blunt force trauma after being hit in the head with a bottle of Lucid brand absinthe on January 12. A friend of her husband claimed in a now-deleted Facebook post that Mrs. West’s death involved “excessive alcohol consumption” and was a “terrible accident”, according to the Daily Mail. Kitty Kat West, who has a 12-year-old son, was found at 5 am. It is reported a cellphone with a green bottle balanced on top was placed nearby. 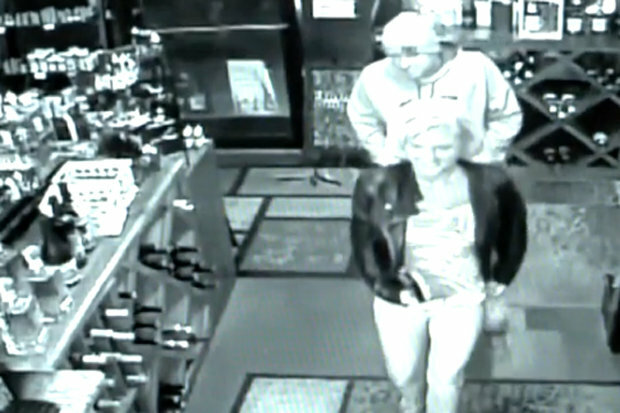 The couple was reportedly having a “date night” on the night of her death and bought whiskey from a local wine and liquor store. CCTV footage, obtained by Inside Edition, showed Mrs. West laughing and her husband patting her bottom. Mrs. West, originally from Tampa in Florida, described herself as a “full-time mommy” and would regularly post pictures with her young daughter and of her two small dogs. Her private Instagram account which boasted nearly 52,000 followers linked to her paid site. A friend told the Daily Mail that her husband “got off” on her online persona.